The most commonly found insects from around the world. 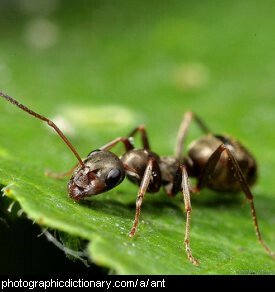 An ant is a small, common insect found all over the world. They live in organised colonies that are mostly workers, with one queen. 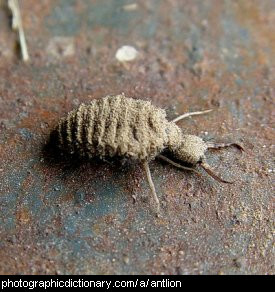 The antlion is the larval stage of a kind of flying insect often called a lacewing. Antlions get their name because they eat mostly ants. They live in dry, sandy areas and make their cocoons out of sand stuck together with silk. They catch ants to eat by digging small pits in the sand. Ants fall into the pits and have trouble getting back out, and the antlion comes out from hiding at the centre of the pit and eats them. 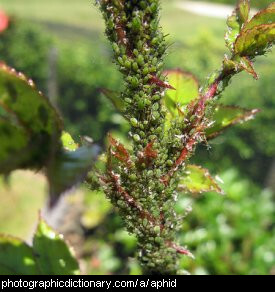 Aphids, also called plant lice, are a tiny, sapsucking insect. 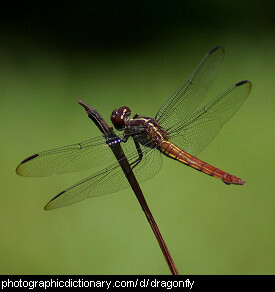 They are attracted to fresh new shoots of plants, especially developing fruit and flowerbuds. They can do a lot of damage to crops, and gardeners do not like them. Aphids can be killed by poison, removed by squirting them off with water from a hose, or their numbers can be reduced naturally by encouraging aphid-eaters like ladybugs and wasps into your garden. The aphids in the picture are on a the developing flower bud of a rose. 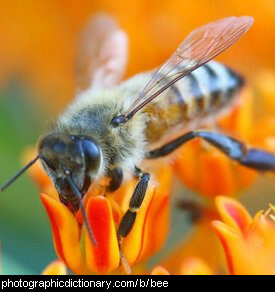 Bees are flying insects that collect nectar and pollen from flowers. Some kinds of bee make honey. Many kinds of bee live in colonies, with hundreds of worker bees and one queen bee. Beetles are crawling insects with hard shells. They often live in dead leaves, under tree bark or among the leaves of plants. 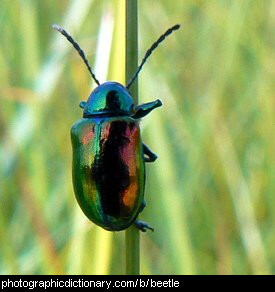 Some beetles have wings under their outer shell and can fly. A small number of beetles can swim, and live in the water. Butterflies are a kind of insect that changes completely as it goes through its life. A butterfly starts as an egg, which hatches into a caterpillar. Caterpillars spend all of their time eating leaves from their favourite plants. When they are old enough, caterpillars spin a cocoon and while they are asleep inside it, they change into a butterfly. 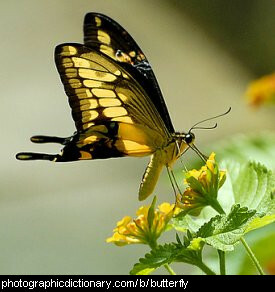 Butterflies eat nectar from flowers, and live for a much, much shorter time than caterpillars. 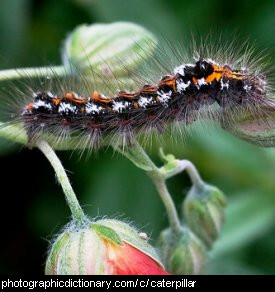 Caterpillars are the larval stage of moths and butterflies. They hatch from eggs and grow very quickly, eating large quantities of leaves as they grow. When they are big enough they spin themselves into a cocoon and go to sleep. When they wake up, they have turned into a butterfly or moth. Cockroaches, sometimes just called roaches, are a type of insect. 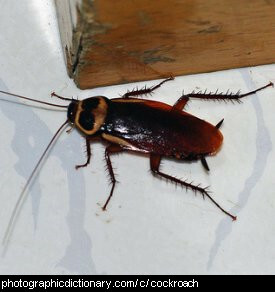 There are thousands of kinds of cockroach but only a few are pests found inside houses. The cockroach in the picture is a German cockroach. They like warm, moist places, and are particularly fond of garbage bins. Crickets are a type of insect distantly related to grasshoppers. Crickets make a distinctive "chirping" noise. Crickets make this noise by rubbing their hind legs together. 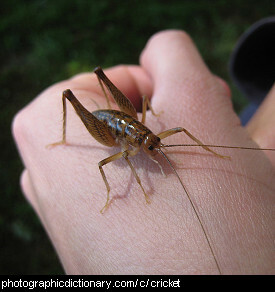 There are many different varieties of cricket, and they all have a slightly different "chirp".